History experts in Dorset have unveiled the secret of an 18th Century love token found in a family archive. Rebecca Donnan, principal conservator at the Dorset History Centre in Dorchester, came across the love token. The token was badly damaged so the history centre made a replica to show how it was folded to read the poem. 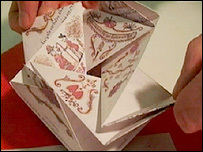 When folded correctly into a square it reads as a poem proposal of marriage written by John Abbott to "SW". No-one is sure if SW accepted the proposal. The original token had been repaired over the years with waste material from stamp books. The poem reads on all faces of the token, which has gone on display at the history centre.